Like many tourists, one of my first stops during my visit to Spain was the Royal Palace of Madrid (“Palacio Real de Madrid” in Spanish). I actually visited twice on consecutive days, because I underestimated how long it would take to properly appreciate all of the exhibits and I wanted to give this beautiful complex the attention it deserved. The Royal Palace is located right in the middle of the old city; buildings that are commercial on the ground floor and apartments (or sometimes hotels) above are separated only by a road and the public parks such as the Plaza de Oriente and Jardines de Sabatini. This means that you can get a good look at the palace even from outside of the gates. It’s possible to look right inside the Plaza de Armeria (the main courtyard) from the publicly-accessible area between the Catedral de la Almudena and the palace. The throne room is on the second floor right above the central doors, and looks over the courtyard and at the cathedral. 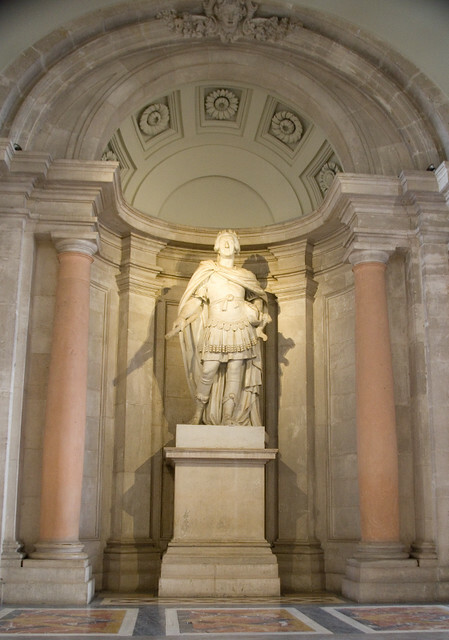 This is the statue of Charles III at the base of the grand staircase. 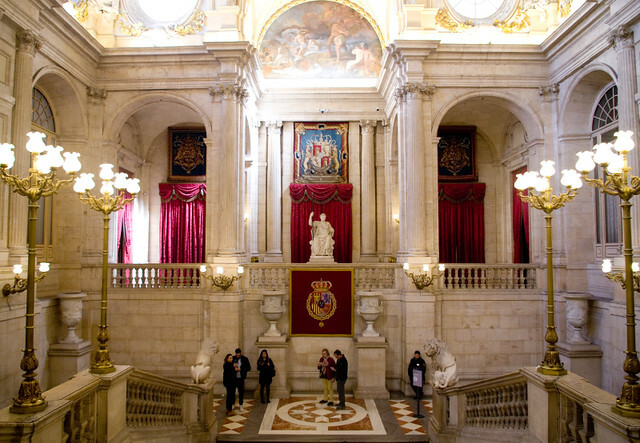 And this is the grand staircase from above, with a statue of Charles IV at the center. It is, quite simply, awe-inspiring in its grandeur. 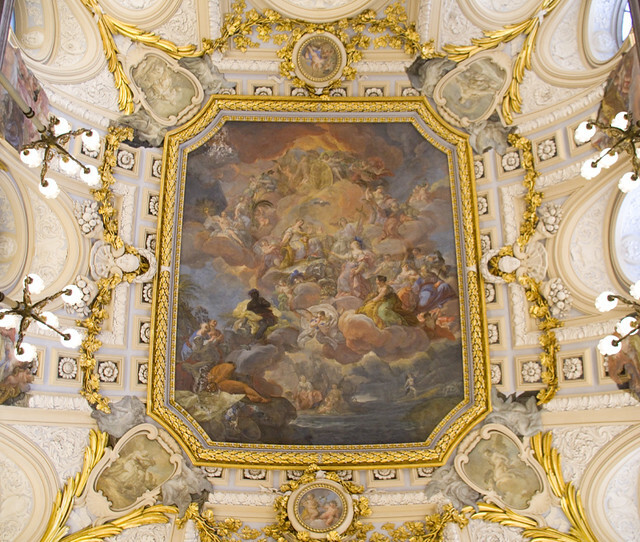 On ceiling above the grand staircase (and, indeed, most of the ceilings inside the palace) is a fresco. As this is probably the biggest single room that I saw, I’d venture to guess that it’s also the largest fresco. It is by Corrado Giaquinto and depicts Religion Protected by Spain (although I have to admit I had to look that up after the fact, I was so gobsmacked by the palace that I forgot less-consequential things like artists and titles). After this, though, I have very few photos of the palace, since there were only a few areas where photos were allowed. Suffice it to say that it is an exercise in opulence and incredible attention to detail. Also on the palace grounds is the armory, which contains fantastic examples of full plate armour (for men, children, and horses) alongside swords, crossbows, and other weapons. Most of the items on display belonged to royalty or upper nobility, so they are beautifully detailed as well. Of course I wasn’t allowed to take photos in there either. 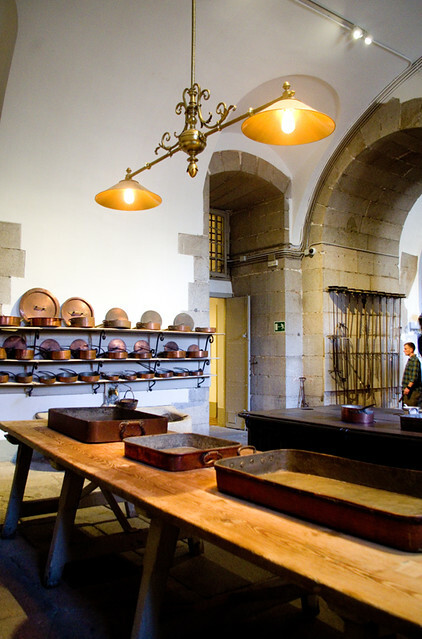 One place that photography was allowed was an extra to the basic tour that I just had to go see: the royal kitchens. They are absolutely huge, which makes sense because they once played host to hundreds of people working at hot, sweaty, tiring jobs that eventually produced all of the food that royalty and nobility at the palace ate. 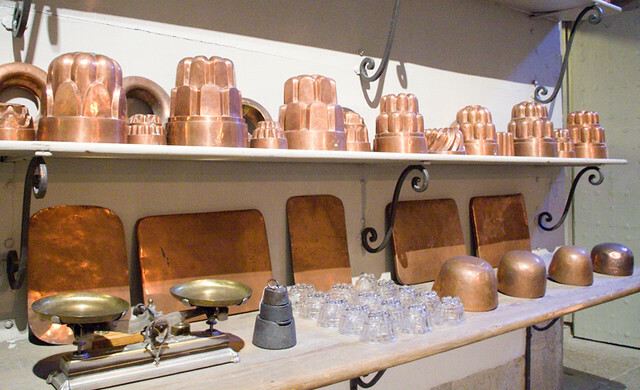 Above is a selection of the kinds of copper and glass molds that were in use. 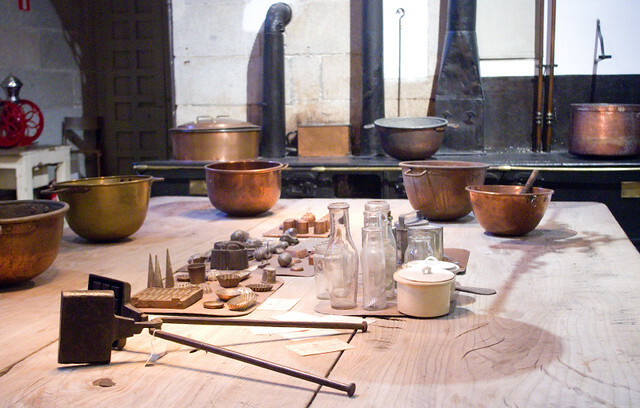 A wooden work table with the more delicate tools for preparing and decorating the foods prepared in the molds. 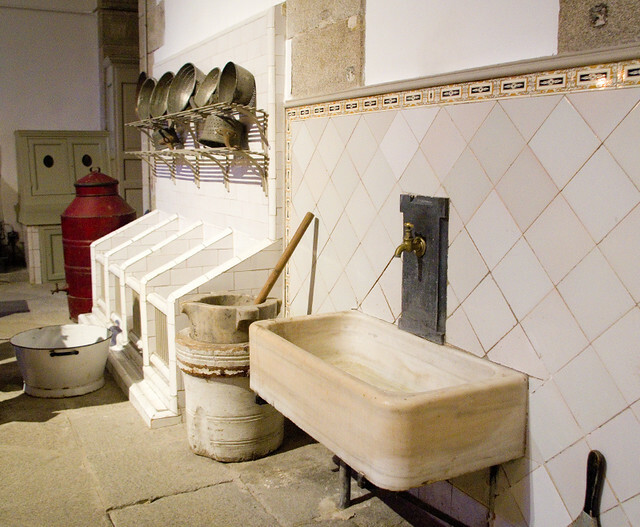 The station for washing vegetables. 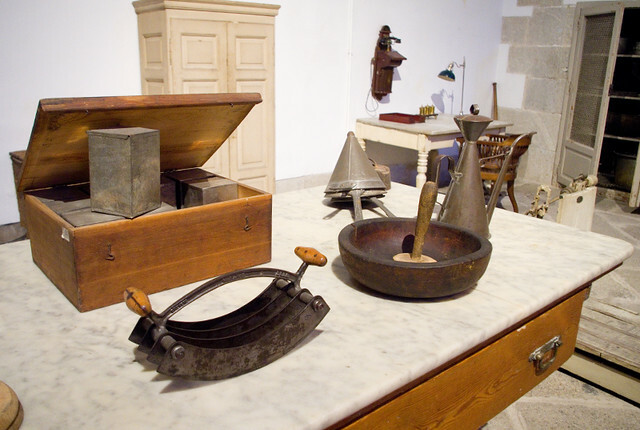 The pastry station with its marble counter top for keeping the pastry dough cool (much as we still use marble rolling pins or rolling pins filled with cold water for the same purpose today — it keeps the lard or butter from melting, which makes the dough flaky). Prep table in the room with the main ovens and stoves. The big rack in the background holds all of the different kinds of spits for roasting above the massive fireplace. The stoves used wood as fuel and the smoke was vented through pipes that ran under the floor, which kept them from having to have overhead chimneys. I’m not sure how they managed to get the chimneys to draw correctly; apparently it was quite the feat of engineering. Notice the high ceilings for air flow; the kitchens were in the basement and the windows that light it and allow for air circulation are at ground level. 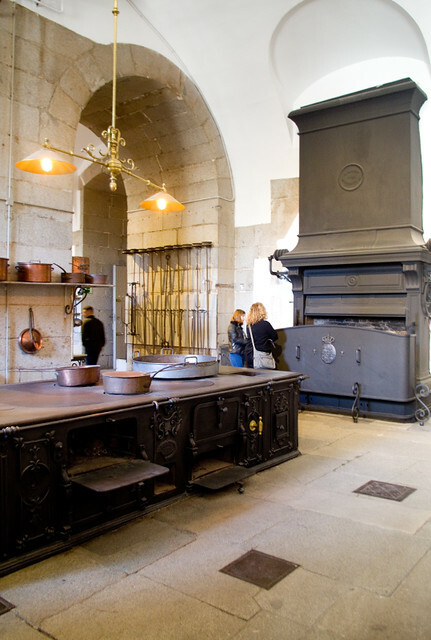 Here you can see another of the massive cast-iron stove/ovens, with the fireplace for spit-roasting in the background. 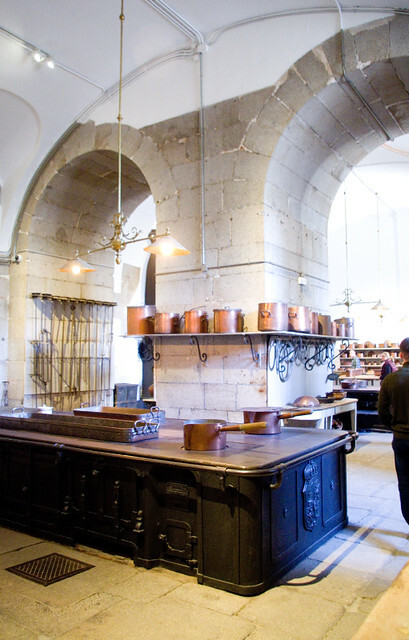 Back when these kitchens were in use, they were often written about by visitors who were impressed by how much work it took to feed the upper classes in the manner to which they were accustomed. They also wrote about how the kitchens ran like a well-oiled machine, or they compared it to a military operation. I personally have a hard time imagining the monumental task it must have been to make these kitchens anything but absolute chaos. My hat is off to the generations of people who worked here. I’m sick as a dog today with a powerful head cold, sinus headache, and fever, which means for the next little while I won’t be cooking anything. Thank goodness for Thanksgiving leftovers! 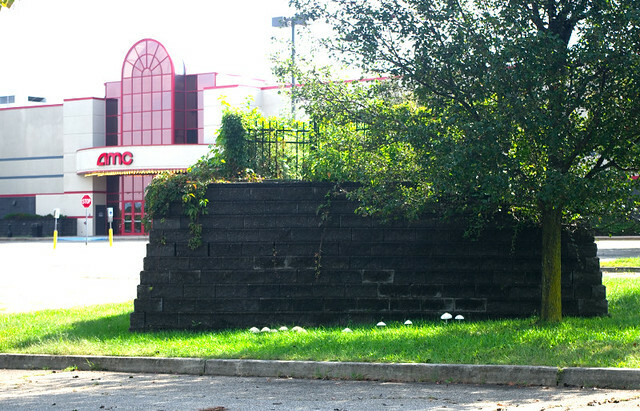 Given that I can’t write about what I’m cooking or crafting or thrifting, since I’m really not up to any of the three, I thought I’d tell you a bit about my recent trip to New Jersey. My husband had a business trip in the Dover area; I left Thing 1 and Thing 2 with my parents for a week and traveled with him. We drove down and stayed in the hotel room that his work would have paid for in any case, which meant that this was a really cheap trip. While my hubby was working during the day, I had access to a car and got to explore the area. Since I have been to the US a few times before (honestly, Dover’s only about a six hour drive from home), I didn’t feel the need to visit the major tourist sites. Instead, I planned my trip with a lot of help from Atlas Obscura. One of my stops along the way was Grover’s Mill Pond, which is accessible to the public via the Van Nest Park. The park has a free parking lot, bathrooms, a playground, a field, and a paved walking path. The path leads to Grover’s Mill Pond, which, according to a plaque, was the subject of a restoration project in 2008-2009, when the West Windsor Township and the US Army Corps of Engineers restored the aquatic habitat by dredging silt from the pond and restocking it with fish. 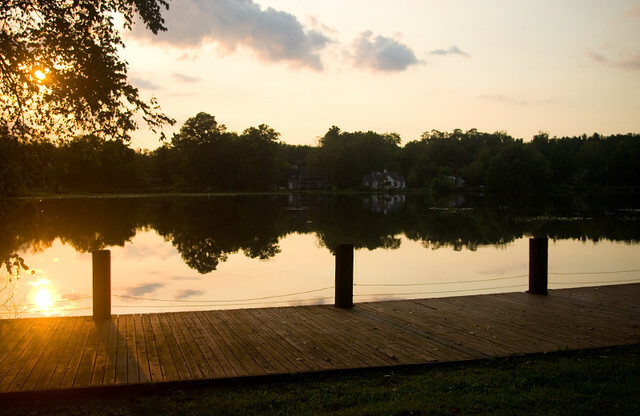 It’s a lovely, peaceful place, with a small boardwalk and benches from which you can enjoy the view. The War of the Worlds was a science fiction novel by H.G. 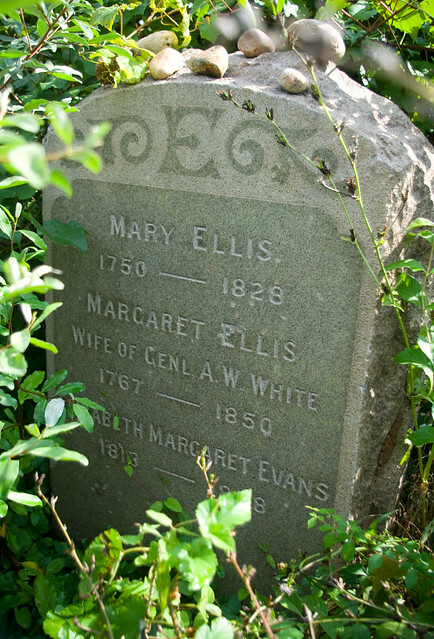 Wells that was adapted by the Mercury Group on CBS radio at 8:00pm on October 30, 1938. The production was directed and narrated by Orson Welles, who also voiced many of the characters. When Welles and Howard Koch adapted the book for a radio play, the script was written and performed so it would sound like a news broadcast about an alien invasion. While the broadcaster made several periodic announcements that the show was a fictional performance, many listeners believed that the events were actually happening. The broadcast was one hour long and consisted of multiple news bulletins which interrupted “Ramon Raquello and His Orchestra” playing smooth jazz. 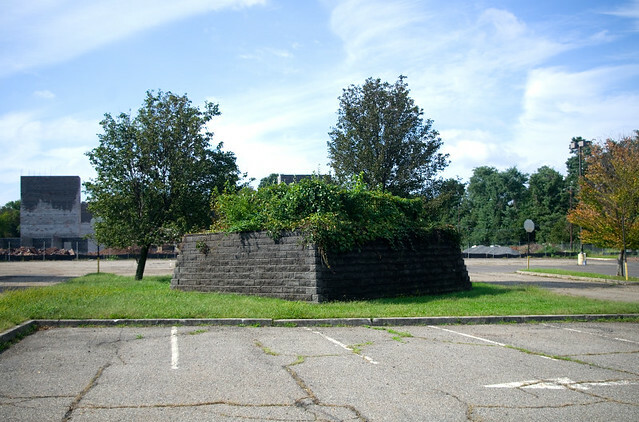 The skit involved on the scene reporters and scientific authorities who reported on the events occurring as the Martian capsule landed in Grover’s Mill. The Martians attacked and destroyed the New Jersey State Militia and then they attacked other cities throughout the country, including New York City. The last portion of the broadcast was a monologue by Welles explaining that the Martians had been killed by a pathogen. To end the show, Welles went back to his normal persona and announced that the show was a Halloween joke. There are debates as to how many people took this fake news broadcast seriously, and how widespread the ensuing panic really was. However, it cannot be denied that the broadcast caused a sensation that remains memorable to this day. It was considered important enough that it was made part of the National Recording Registry of the Library of Congress in 2003. You can listen to a recording of the original broadcast here, or, if you would prefer, a transcript is available here. The entire time I walked through the park, I had The Eve of War (a modern version of which I have linked above) playing in my head. For me, the War of the Worlds that I grew up with wasn’t actually the 1938 radio play, but Jeff Wayne’s Musical Version of The War of the Worlds, which was narrated by Richard Burton. I believe my mother had it on record, or she borrowed it from one of her friends. She then made my brother and I a copy on tape — and it terrified me. The concept of the Red Weed terrified me especially, for some reason, and I would have the most vivid nightmares. My little brother, on the other hand, absolutely loved it. He would listen to it over and over as loud as his little tape deck would play, and I could hear it throughout the house. It got to the point that even hearing the opening chords was enough to bring me to tears — so, of course, in the way of all pestering younger siblings, my brother made a point of torturing me with it as often as possible. As an adult, though, I can appreciate the album for its beautiful score and slightly trippy 70’s vibe. And I think that my grounding in this album made me really appreciate the sound design of Steven Spielberg’s 2005 adaptation, where the tripods sound like a cross between those opening chords and the ship from Close Encounters of the Third Kind. Looking toward Grover’s Mill Pond from the park (but not actually visible from the path to the pond due to a bush), there is a large metal plaque dedicated to the fictional Martian landing site. 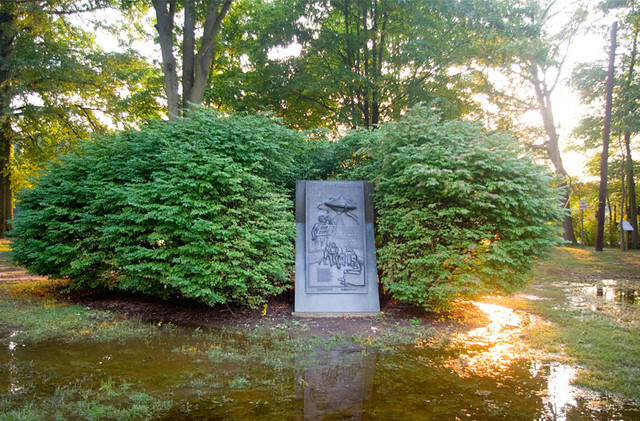 If the bush wasn’t in the way, you’d be able to see the pond directly behind the monument. Despite what this photo looks like, the area is not usually under water; New Jersey has had record levels of rain this summer, and the ground has simply reached its saturation point, so there is standing water in a lot of lower-lying areas. 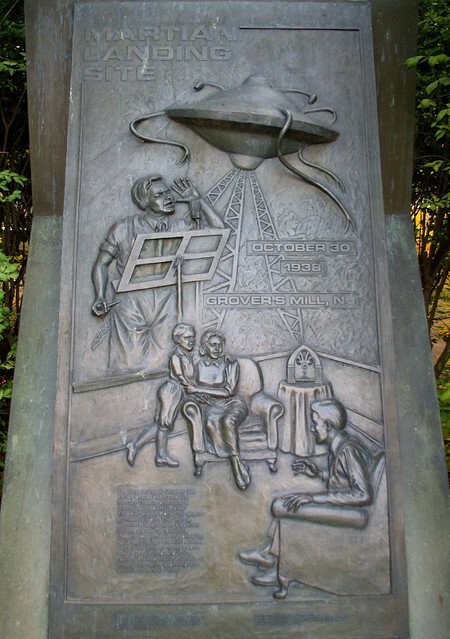 One of the things I find interesting about this monument is that the Martian ship more closely resembles a flying saucer, while the crafts are described as tripods in the broadcast, just like in the original novel. The idea of flying saucers really caught on after the 1950’s, long after the broadcast. I guess the scaffolding-looking area underneath the saucer could be tripod legs, but it really looks much more like a modern depiction of a flying saucer. On the evening of October 30, 1938, Orson Welles and the Mercury Theatre presented a dramatization of H.G. Wells’ The War of the Worlds as adapted by Howard Koch. This was to become a landmark in broadcast history, provoking continuing thought about media responsibility, social psychology and civil defense. 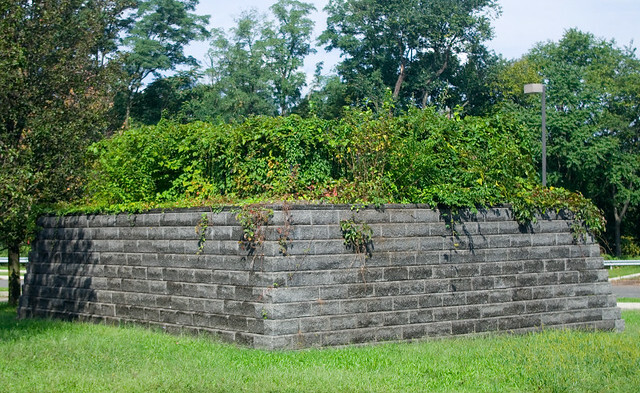 For a brief time as many as one million people throughout the country believed that Martians had invaded the earth, beginning with Grover’s Mill, New Jersey. Although this was a small monument, I really wanted to see this particular place because The War of the Worlds played such an enormous part of my cultural upbringing. I am sure that it influenced to my interest in horror storytelling, music, and sound design. It definitely contributed to my lifelong obsession with the weird and wonderful. Day 2 of camping at at the Achray Campground on Grand Lake in Algonquin Provincial Park dawned rainy, but the precipitation quickly moved on. This left us with clouds in the morning, a brief rainstorm in the afternoon, and a mix of sun and clouds for the afternoon and evening. Unfortunately, there was never much of a breeze, so nothing we brought with us really dried out, but we had fun anyway. 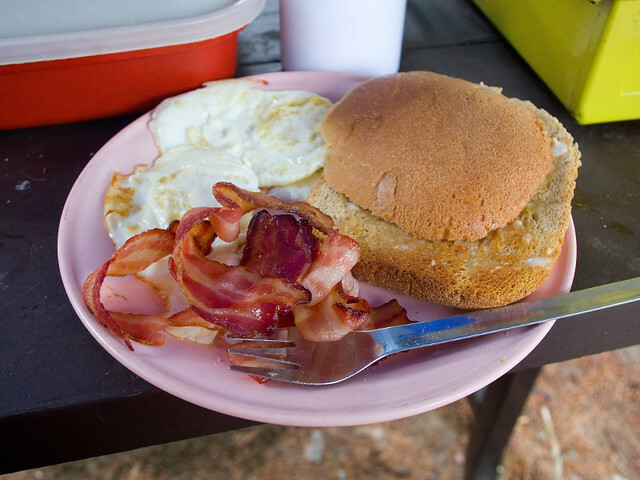 The day began with cooking bacon, eggs, and toast (with bread machine bread baked in advance of our trip) on the old Coleman camp stove. 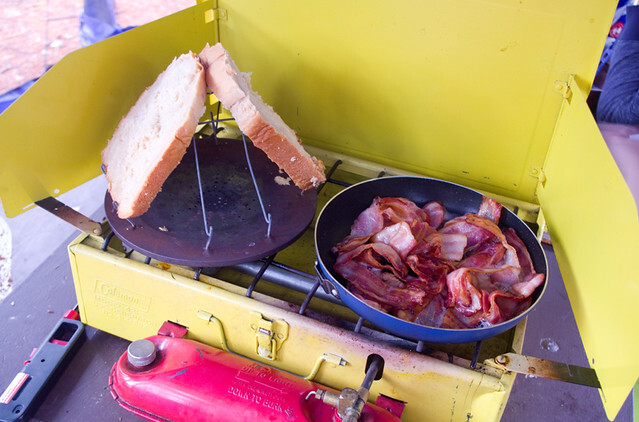 I am particularly fond of the camp toaster, which was always my favourite part of the setup as a child. It was a hearty and delicious way to start the day! After cleanup we headed out to the lake, which is where we spent the majority of our day. 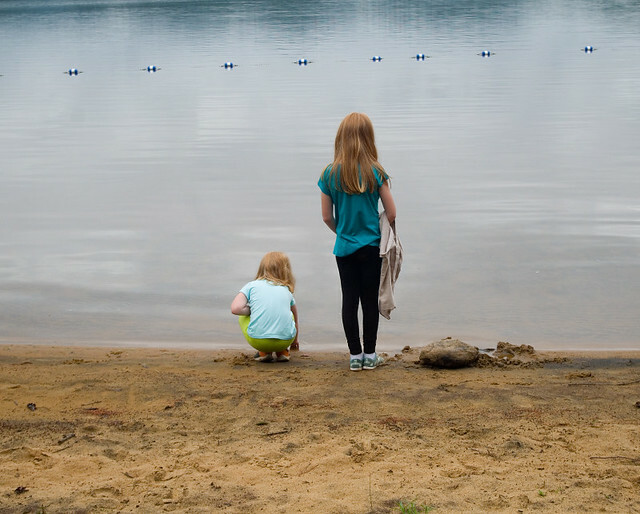 The shallow, sandy beaches meant that the kids were quite content to play and explore for hours. 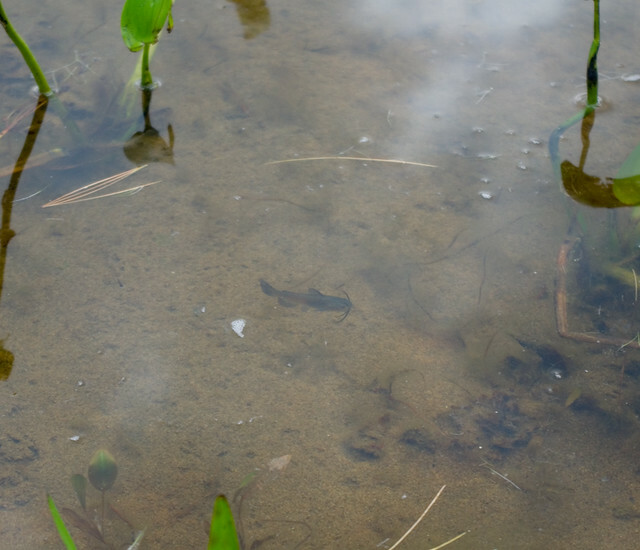 We found teeny tiny catfish (at most an inch and a half long) in the weedy shallows, where they were industriously cleaning the lake bed. 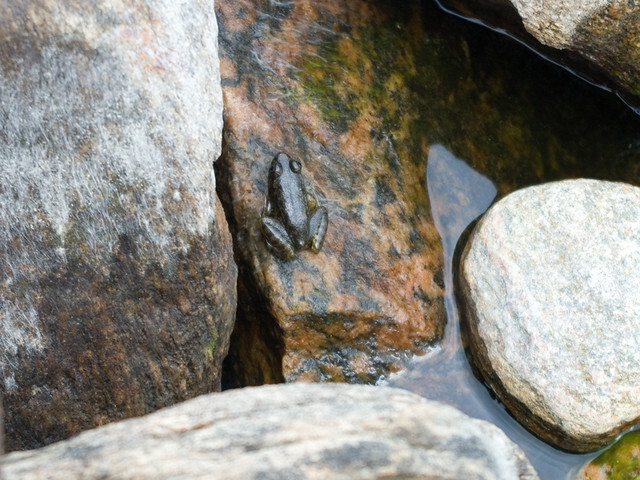 There were also tonnes of tadpoles in every stage of becoming frogs — some had no legs, some had two, some had four, and some were basically frogs with tails — alongside full-grown frogs. A few swam by us while we were swimming, while others stuck to the weedier or rockier areas. I honestly think that our favourite part of the day was all of the tiny minnows that swam around our feet and nibbled on our toes while we waded in the shallows. Video of that will have to wait until I can get it off of my other camera, but I think it’ll be what the kids remember the most from this trip. 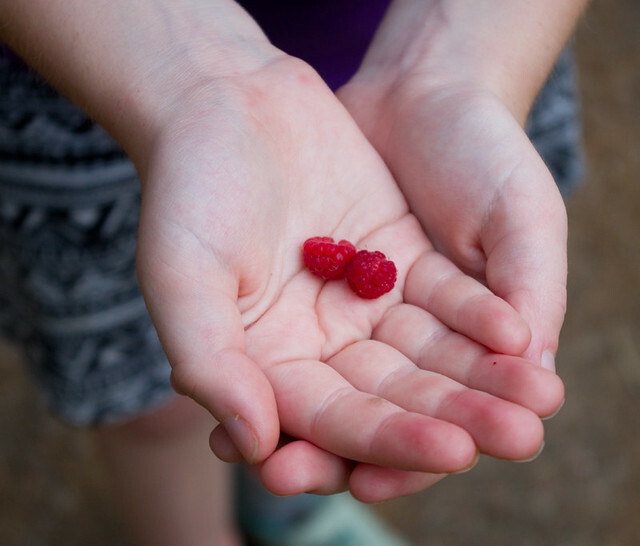 When we headed away from the water we found wild raspberries, which was an unexpected and tasty treat. 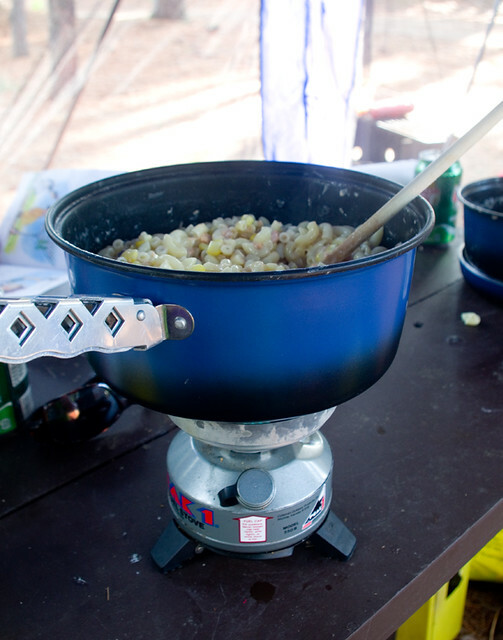 I cooked dinner over the single-burner backpacking stove, since the old Coleman decided to act up for a bit. 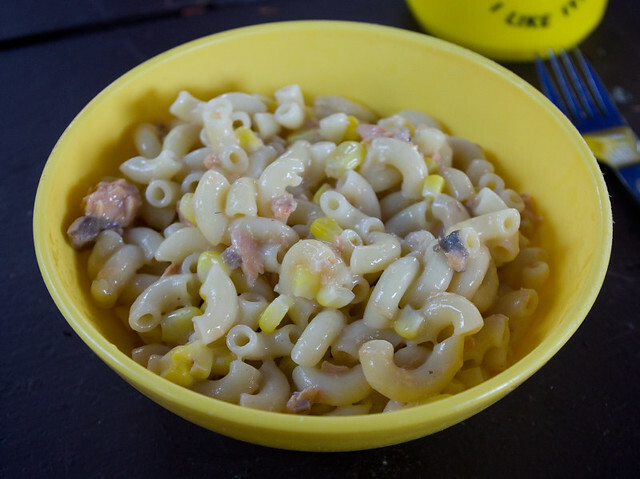 I basically made tuna noodle casserole, but with frozen corn instead of canned, and canned salmon instead of tuna. Also, having no oven, I couldn’t bake the dish. I don’t think that my alterations improved the dish any; without the potato chips topping and baking to combine the flavours, it was pretty bland. I should at least have grated some cheese on top, but I didn’t think of it. But it was warm and filling and we were sitting somewhere dry, which sometimes is all you can ask for when camping. As a bonus, the only perishable ingredient was the frozen corn, which in its turn helped keep the other food cold. Also, did I mention that there were butterflies? Well, there were a lot of butterflies. 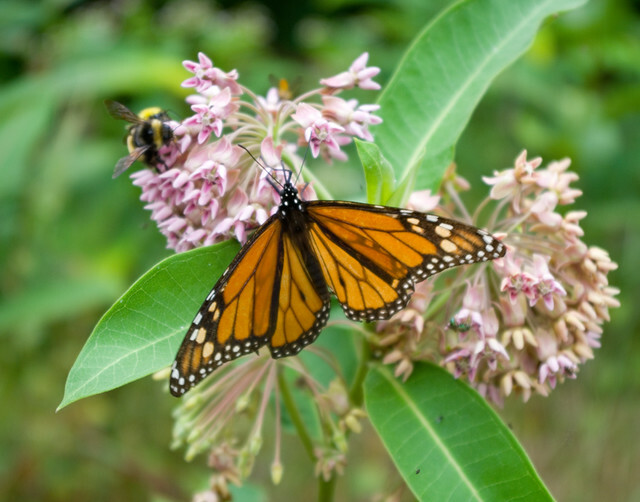 The monarchs in the area really like the milkweed blossoms, which were just coming out of bloom, and milkweed was everywhere. Apparently these monarchs are endangered, but you’d never know it from how plentiful they were around our little corner of the park. 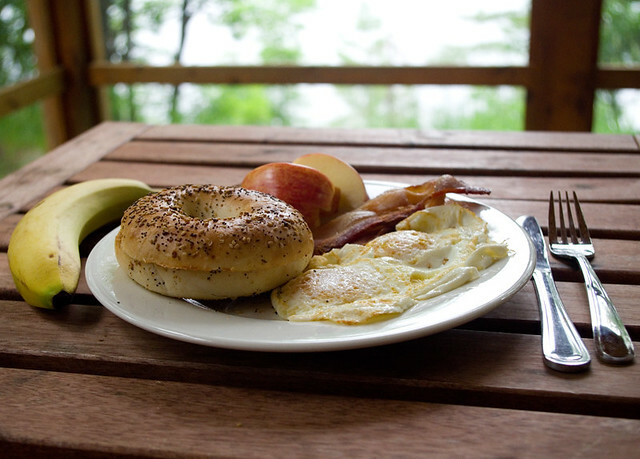 We started Sunday with a hearty brunch eaten out on the porch at my in-laws’ cottage. I had bacon, eggs over easy, an everything bagel, apple slices, and a banana. 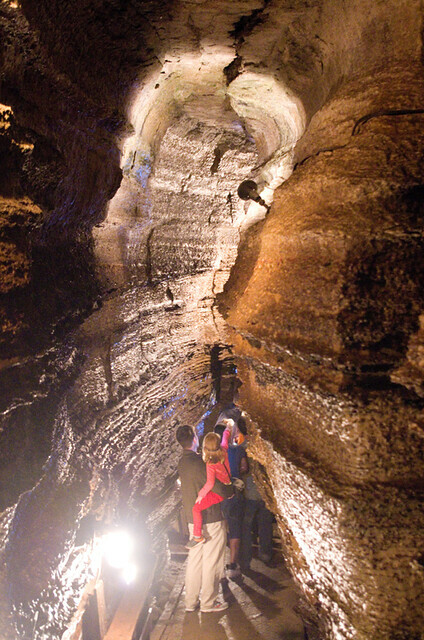 With this fuel under our belts, we made the drive out to the Bonnechere Caves, which are caves carved by the Bonnechere River into limestone deep underground. I’d been there once as a child, and again as an adult bringing my eldest along, but this was the first time that both kids had been old enough to partake in the tour. I think that it was an experience that they won’t soon forget! 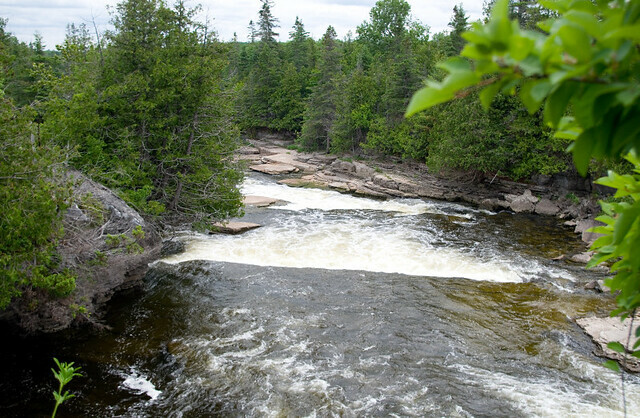 The tour started outside along the Bonnechere River (you can actually see the natural entrance to the caves on the left). 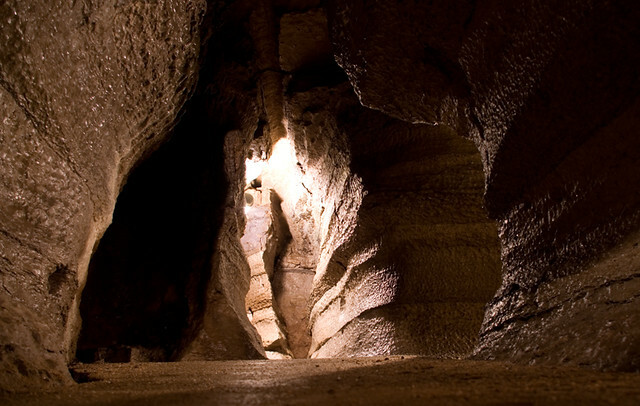 Then you take a man-made staircase down into the bowels of the caves as part of a guided tour. We’d been to the Lusk Caves a few years ago, where the caves are left au naturel (although there is a trail leading to them) and there is no guide, so this was a very different experience. 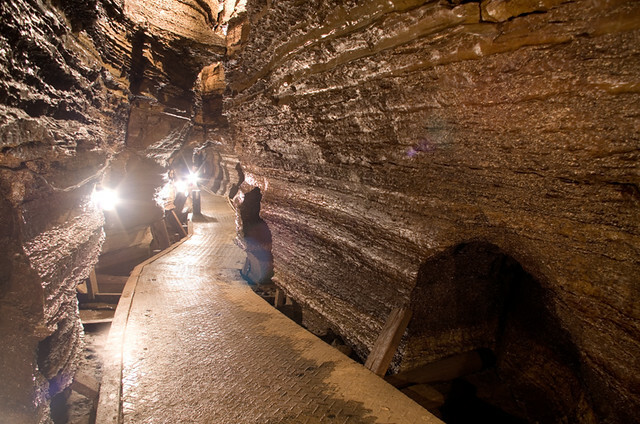 There is a boardwalk over the naturally jagged stone floors, and the caves are lit. Despite the somewhat staged air that the man-made additions add, they did allow me to get a much clearer look at the rock formations. It was a very neat experience. 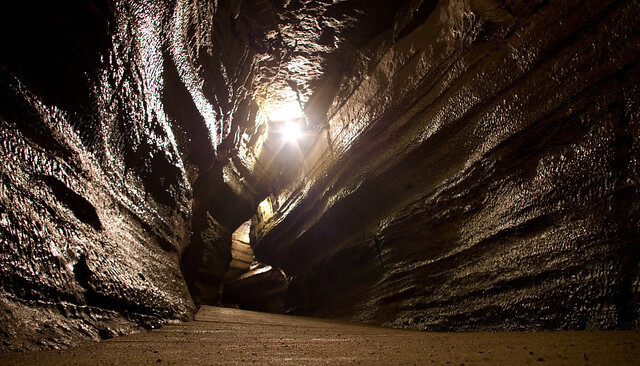 Maybe one day I’ll be lucky enough to take yet another generation of children to explore this enthralling natural formation. Of course, after all of our spelunking we were ravenous, so we headed back to the cottage for dinner. 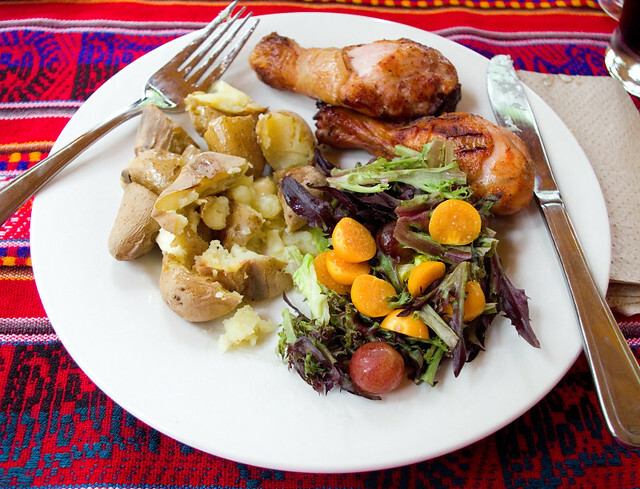 We chowed down on grilled chicken legs with hot sauce, roasted fingerling potatoes, and a salad of mixed greens, red grapes, and ground cherries. What a great way to round out the day! 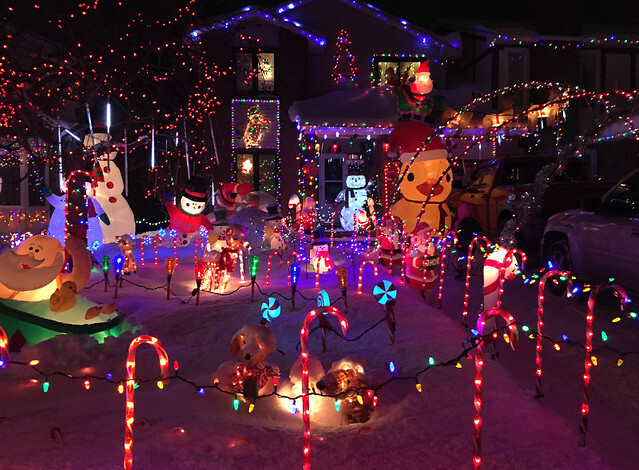 Taffy Lane in Orleans (a suburb in the east end of Ottawa) is well known throughout the city for its possibly-excessive number of Christmas lights. Traffic moves slowly on this residential street almost every evening throughout December as people walk and drive to check out the decorations. They’ve been doing this for over thirty years! My children and I love this street and make a point of visiting at least once a season — preferably after the snow flies, because the light reflected off of the snow makes everything that much more sparkly. 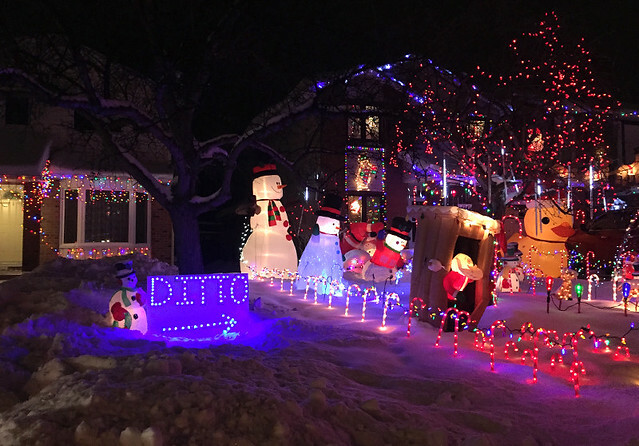 1092 Taffy Lane, which is my kids’ favourite, and not only because of Santa in the outhouse. And then 1094 Taffy Lane. Gotta love that sense of humor. I hope everyone had a happy and healthy holiday! This past weekend was a busy one, and it would have been even busier if I hadn’t been sick on Sunday. 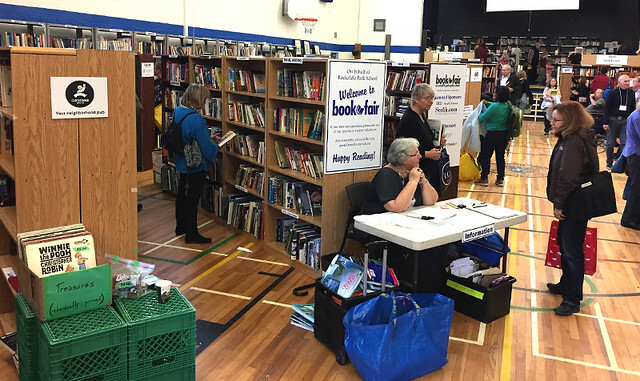 It started off in grand fashion with a trip to the Rockcliffe Park Book Fair. They advertised that they had over 30,000 used books, CDs, DVDs and records… And I think they delivered. To be totally honest, a sale like this is a little slice of heaven for me. I’ve been a bookworm ever since I can remember; it was one of the things that I was teased the most for as a kid. That didn’t slow me down, though, and now I wear the label with pride. 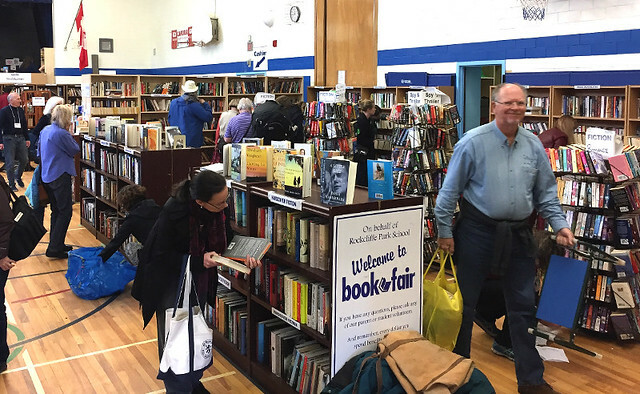 All of these books piled high in a gym brings me right back to the happiest days of my childhood, when the Scholastic Book Fair would come to my school. I would bring the money my parents gave me, plus all of my saved allowance money, so that I could bring a stack of books home with me to keep. (Libraries are like a second home to me, but having books I didn’t have to give back was an extra-special treat.) Of course, now that I’m an adult I can drive out to a bookstore any time, but the prices at a used book fair are so much more affordable — and it’s somewhere that I can pick up vintage and out-of-print books as well as new releases. I came home with two big bags of books, mostly novels and a few Christmas gifts. (Yes, I do buy some of my gifts second-hand; there’s a lot of stuff that is just as good that should be reused instead of going to the dump, and some things just aren’t available any more.) I did find a few cookbooks that I just had to have, though. – Julia Child’s Menu Cookbook (Julia Child, 1991) — This one is a reprint of Julia child & Company and Julia Child & More Company. It’s hard to believe, but this is the first Julia Child cookbook that I have ever owned. 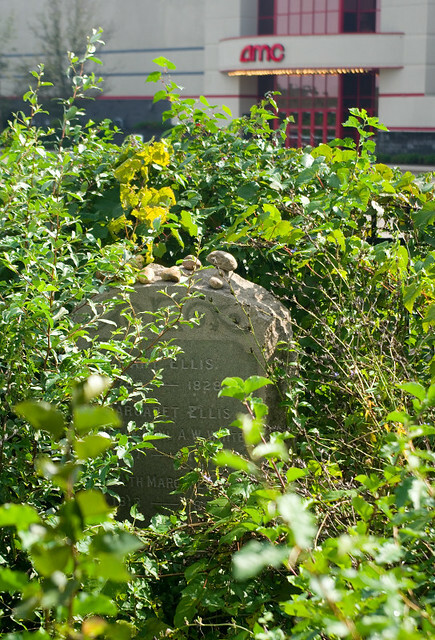 – Incredible Edibles: 43 Fun Things to Grow in the City (Sonia Day, 2010) — Okay, not technically a cookbook, but it’ll lead to more cooking in the end. – A Modern Kitchen Guide: A complete Book of Up-to-Date Recipes and Household Hints (Farmer’s Advocate and Canadian Countryman, 1946) — This is the book with the blank red spine. It’s one’s old enough that I haven’t found it online, which makes it all the more interesting to me. – A Little Canadian Cookbook (Faustina Gilbey, 1994) — This one is autographed by the illustrator! What a great haul! And what a lovely way to spend a few hours for a bookworm like me!